Unlike previous years, where Mobile World Congress would showcase the premier devices on the latest chipsets, this year was more muted. The product cadence for most companies is slightly offset, due to chipset availability. Some companies were not announcing their latest devices, while others were previewing what is to come. So any device manufacturer willing to state they have a device with Qualcomm's Snapdragon 845 SoC in the pipeline was interesting news. One such company was AGM, distributing information about its upcoming flagship, the X3. AGM is primarily known for various rugged smartphones, aimed at professionals working in harsh conditions or active lifestyle aficionados. In most of the cases such rugged devices are bulky and are generally not stylish, which typically shrinks the addressible market. However, this year AGM plans to add a more elegant model to its lineup, which will be powered by Qualcomm’s Snapdragon 845 SoC and will feature specifications in-line with top-of-the-range smartphones from other makers. 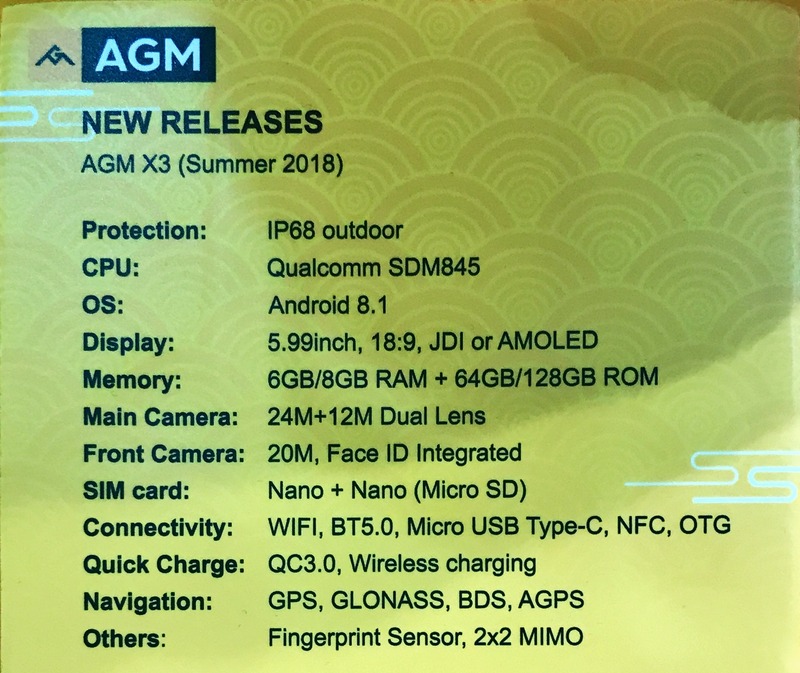 AGM’s flagship X3 smartphone promises to be 'light and professional', implying a focus on premium materials, yet like all AGM handsets it will be IP68-rated against dust and water. The phone will feature a 5.99” display with an 18:9 aspect ratio and will be based on Qualcomm’s Snapdragon 845 SoC. AGM will offer two versions of the device: one equipped with 6 GB of RAM and 64 GB of storage, another outfitted with 8 GB of LPDDR4X and 128 GB of NAND flash. Connectivity features of the AGM X3 will include the integrated X20 LTE modem in the SoC, 2x2 802.11ac Wi-Fi, Bluetooth 5.0, NFC, and USB Type-C. Imaging capabilities of the phone will comprise of a dual rear camera featuring 24MP and 12MP sensors as well as a front camera featuring a 20MP sensor. As for security features, the smartphone will support a fingerprint reader and a facial recognition technology. 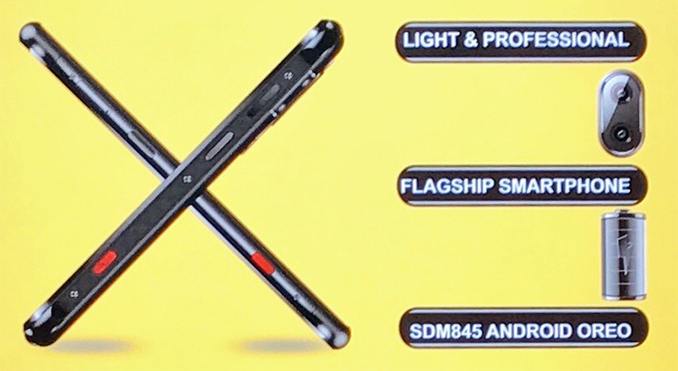 AGM did not demonstrate a physical version of the X3 handset at the show - the only materials regarding the new unit were a flyer and a poster. The only visuals the poster showcased were the left and right sides of the phone. Based on these pictures, we can see that AGM plans to use its traditional bolts in the construction, but this is about it. AGM stresses that the phone will be considerably sleeker than its X1 and X2 smartphones already in the market, but does not disclose whether it plans to integrate its signature sensors its phones are also known for (e.g., air pressure sensor, ambient temperature relative humidity sensor, VOC sensor, etc.). Which market segments AGM plans to target with the X3 is unknown, but given the fact that the X3 is to be based on the Snapdragon 845, it will rival flagship phones from other makers. AGM intends to launch the X3 smartphone this summer. Unless something has gone horribly wrong or you are video editing 2GB should be fine. I am writing this on a 4GB PC running VMs. My Android tablet has 1.5GB and has no issues. I struggle with three GB, but I'm quite a heavy user, running Ingress and Pokémon GO at the same time, while wanting a browser with 10ish tabs, LINE, Facebook, Instagram, a dictionary, and usually one other quite heavy app all to not be put to sleep. I think the problem is simple, today kids expect that Phone be mobile versions of game computers and desired more ram for such gaming.